Multiplay via Wi-Fi has been added. 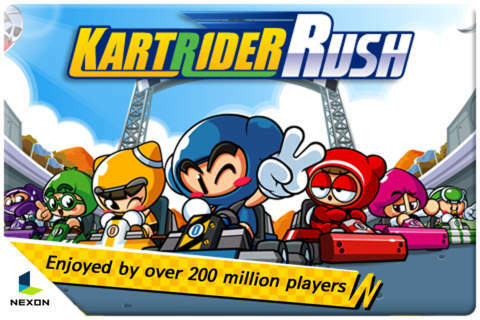 You can now enjoy Kartrider Rush multiplay with both iPhone and Android players. For Wi-Fi multiplay with Android, both iOS and Android need updates to 2.2 or higher version. Flip & Devil items have no effect during multiplay with Android. 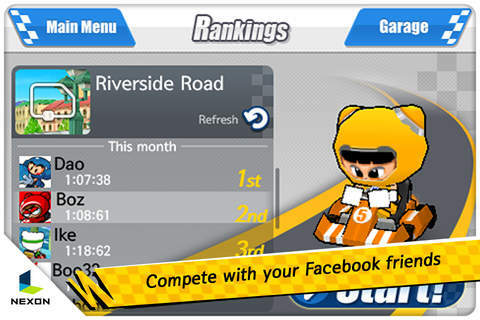 The racing game enjoyed by over 200 million players worldwide is finally available on the iPhone! With over 200 million drivers in Korea, China, Taiwan, and many other countries, KartRider is already a phenomenally popular online racing game. KartRider Rush takes all of the fun of the original and adds in exciting new twists, including an all new acceleration sensor and touch controls! Anyone can drift with ease in KartRider Rush, and nothing beats the rush of a perfect drift through an 180 degree turn! Best of all, the game is free! If you enjoy it, you can choose to purchase more tracks, anything from simple courses that rookies can navigate with ease to treacherous tracks riddled with dangerous curves! The game features two game modes: Item Mode and Speed Mode. In Item Mode, players attack each other with items in a furious race to get the gold! 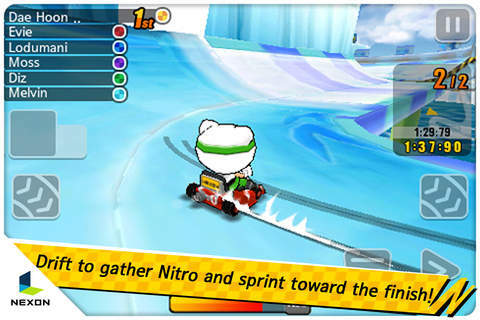 In Speed Mode, players drift to gather Nitro, which grants bursts of speed to sprint toward the finish! 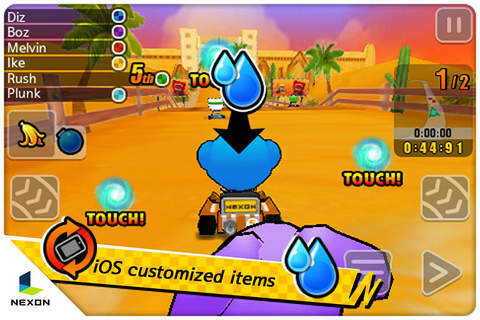 -KartRider Rush runs best on the iPhone3GS or later and iPad. -Multplayer may not work optimally in iOS version 4.1 or earlier. -KartRider Rush requires more memory than what is available on these devices. 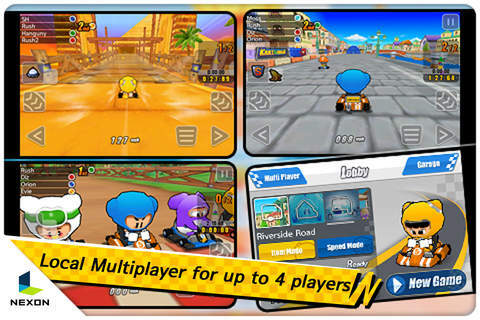 -Local multiplayer is available using Bluetooth for up to 4 players. -Please turn off your WiFi connection for maximum Bluetooth bandwidth. -It is possible your device does not have enough memory available to run KartRider Rush. -Double-click the home button to bring up the multitasking dock and turn off unused apps.